Welcome to Brick House Pizza – The Best Eatery in Brainerd for Lunch & Dinner! Brick House Pizza is owned and operated by Bob Sullivan and originally opened its doors in 1999 as a 110 seat pizza and sandwich restaurant in Brainerd, MN. Committed to the highest standard of cleanliness, food quality and service. We will be committed to having the best quality pizza in the Brainerd lakes area at an affordable price. Today Brick House Pizza has been completely remodeled and renovated with a new name, menus, and lots of smiling faces. New owners invite you to stop in for breakfast, lunch, dinner or any time in between and see for yourself why Brick House is Brainerd’s most complete eatery with fresh baked goods, specialty coffee and the best pizza in town! Brick House Pizza is four businesses in one! ♦ A Restaurant with spacious tables and booths. Host a meeting or bring in the family. ♦ A New York style delicatessen. 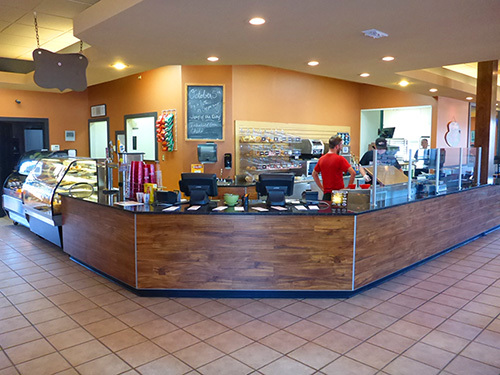 ♦ A bakery where bread loafs, caramel and cinnamon rolls, brownies & bagels are prepared for you daily. ♦ A Take-Out, Catering and Delivery Service.